Working with Kari and Derek on their destination wedding at Lanikuhonua was such a joy! They are true dream clients. 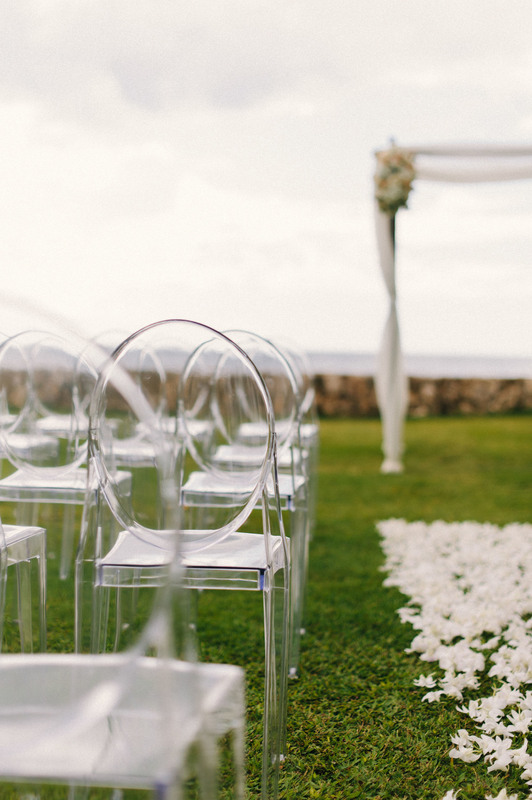 They were both equally involved in the planning process but each had their specific priorities and in the end, everything came together beautifully! Kari and I hit it off from the first phone call and designing a wedding where the bride had such an eye for design and detail, made my job fun and easy. We were both so excited when we met for the first time after our 11 month partnership just one day before the wedding! Kari had a specific vision for their wedding so I assembled a top notch team of vendors to bring everything to fruition. She loved the romantic, muted tones of peach, seafoam and gray but also wanted a touch of contemporary elegance. The floral designs and chandeliers were more vintage in style and we added some more modern pieces in the ghost chairs and lounge furniture. I paid homage to her graphic design background and incorporated a bolder chevron print into her table runners and cake. Kari’s playful side was reflected in more whimsical elements like the Viewfinder save the date (which was super adorable!) and her paper elements, like the cupcake flags and paper straws for their signature cocktail, the Caipirinha. Kari even designed her own invitation suite and menu cards! Along with the décor, food and the guest experience was very important to them and Chef Peter blew everyone away with the 5 course plated menu. Everything tasted as amazing as it looked. From the seared scallops to the melt in your mouth pork shoulder, service and presentation were impeccable. Such a superstar team to work with! 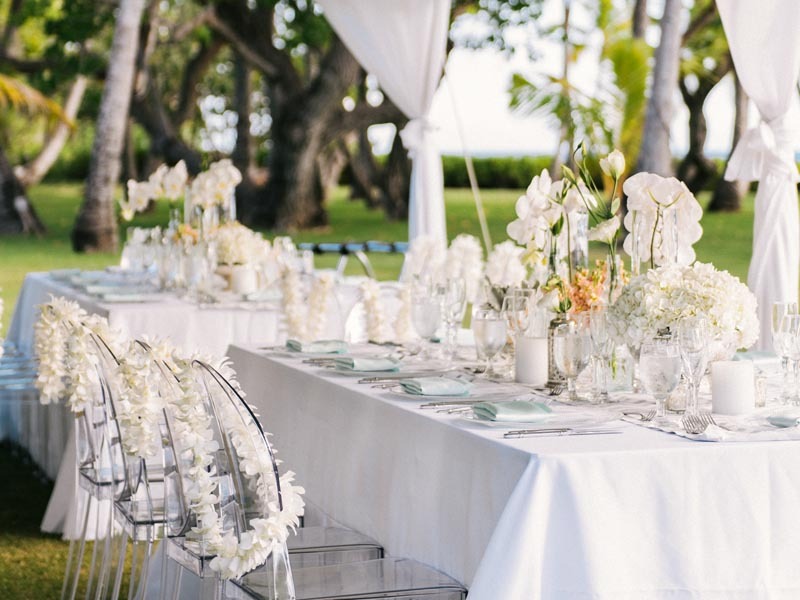 This is one of those weddings that us consultants dream about…a fun and stylish wedding vision, a super cool and head over heels in love couple, in synch and on the same wave length throughout the planning process and beautifully orchestrated wedding day from start to finish with rave reviews – and in Hawaii – who could complain about that? Bride's Wedding Band: Tiffany & Co. Bridesmaids' Accessories: Tiffany & Co.